As first responders to fires, public safety and medical emergencies, disasters and terrorist acts, FDNY protects the lives and property of New York City residents and visitors. The Department advances public safety through its fire prevention, investigation and code enforcement. As part of enforcing the fire safety code, violations are issued to notify the respondent of a condition that affects public safety. The FDNY issues a variety of violations, ranging from violations that do not carry a fine, to criminal summonses which can lead to an arrest warrant. Most violations issued, are simply an order to correct a violating condition. You may avoid a penalty altogether if the violation is not marked hazardous and you file the certificate of correction within 35 days from the day the violation was issued. A notice of violation from the FDNY may allege more than one violating rule, you may therefore wish to certify correction for the rule individually if some rules can’t be corrected. Each rule carries a separate penalty if found in violation. Some violations qualify for a hearing at the Environmental Control Board (ECB), where you may present a defense to dismiss the violation. The presiding Administrative Law Judge (ALJ) may accept testimony and evidence and forward their recommendation to the Commissioners’ designee for final decision and order. You can file a “certificate of correction” form (which can be downloaded from the page on our site) with the issuing agency. In it, you admit that the condition or conditions causing the violation existed, and you sign a statement that says you corrected the condition(s). If you file this on time, you should avoid getting a fine for the violation and avoid having to appear at the Environmental Control Board (ECB) before an Administrative Law Judge (ALJ) at a hearing. But if you file the certificate late, or if an inspector inspects the building and finds that you didn’t really correct the condition, you must appear at the hearing, where you can then challenge the violation. You should inquire whether your certificate of correction was approved. If it wasn’t approved, you should appear at the hearing. You may choose not to certify correction of the non-hazardous violation and instead appear before an ALJ on the hearing date stated on the violation notice to challenge the violation. Some violating conditions qualify for a stipulation agreement which you may accept at the time of the hearing. If you have been offered a stipulation agreement, in which you admit the alleged violating condition and are required to pay a minimum fine, you have an opportunity to extend the correction period from 35 to 90 days, depending on the alleged violation. Repeat Offender Violations: You must appear before an ALJ at a hearing on the date listed in the violation notice. At the hearing, you can either show that you corrected the violation or challenge the allegation altogether. Beware that if you challenge the alleged violation it is likely that the case will be adjourned for a later day and time to allow the presence of the issuing officer and hear his/her testimony. If you plan to defend yourself, you will need to provide evidence to support your claim. However, if you use a meritorious defense, the issuing officer might be requested and the case will be adjourned for a later time and day. If you feel confident to handle this process, you might want to give it your best and be successful. M. Ben Reich offers the service of representing its clients at these proceedings for a reasonable fee. Taking into account the thousands of cases and appeals it handled you can be assured that your case will get the proper representation you expect. Carbon-monoxide detectors: FDNY is now enforcing the NYC Local Law 7/04, Fines can range up to $5000.00. What are building owners’ responsibilities under New York City’s new law on carbon monoxide detectors? Provide and install at least one approved carbon monoxide alarm within each dwelling unit. 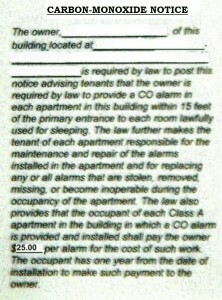 The carbon monoxide alarms must be installed within fifteen feet of the primary entrance to each sleeping room. This applies to all multiple dwellings and one- and two-family homes. 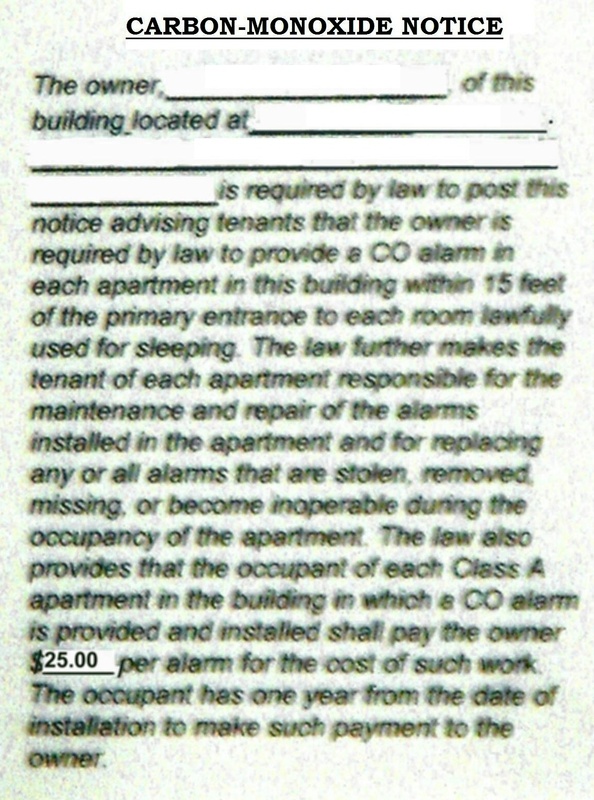 Post a notice in a form approved by HPD in a common area informing occupants of Local Law # 7 requirements. This applies to class “A” multiple dwellings. “A” units are dwellings used, as a rule, for permanent residences. The typical residential apartment is an “A” unit. Provide a notice in a form approved by HPD informing occupants of Local Law # 7 requirements. This applies to non-owner occupied units in private one- and two-family homes. Provide written information regarding the testing and maintenance of carbon monoxide alarms, including general information concerning carbon monoxide poisoning and what to do if a carbon monoxide alarm goes off, to at least one adult occupant of each dwelling unit. This applies to class “A” multiple dwellings and non-owner occupied units in one- and two-family homes. 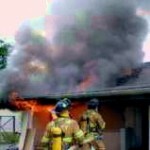 Keep all records relating to the installation and maintenance of carbon monoxide alarms and make them available upon request to the Department of Housing Preservation and Development (HPD), the Department of Buildings (DOB), the Fire Department and the Department of Health and Mental Hygiene (DOHMH). Records for all multiple dwellings must be kept on the premises unless HPD grants permission to keep them elsewhere. Records for non-owner occupied units in private dwellings may be kept by the owner. Keep and maintain the carbon monoxide alarms or systems in good repair. This applies to class “B” multiple dwellings. “B” units are dwellings used, as a rule, on a temporary basis. For example, single room occupancies are typically B units. Some units in buildings without fossil fuel burning furnaces or boilers may be exempt (to see the Department of Buildings regulations and for more information). CO detectors are also required in dormitories, nursing homes, and schools. To pay FDNY prevention or inspection fee. Check the status and print your public assembly permit. View the new fire code, or view the Rules of the FDNY. To submit a request for a copy of a violation, complete this form. 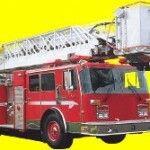 The fire engine will drive you directly to the FDNY website for more information and resources.